The crewed version of SpaceX's Dragon space capsule has passed a key design review, moving one step closer to carrying astronauts into orbit, NASA officials announced Thursday (July 12). In the review, which was conducted June 14 at SpaceX headquarters in Hawthorne, Calif., company officials gave NASA details about every phase of a potential crewed Dragon mission to the International Space Station. SpaceX outlined how it plans to modify its launch pads to support such a mission, and it discussed the Dragon capsule's docking capabilities, living arrangements, weight and power requirements and potential ground landing sites and techniques, NASA officials said. The Dragon capsule is designed to carry seven astronauts to and from space. "The successful conclusion of the concept baseline review places SpaceX exactly where we want to be — ready to move on to the next phase and on target to fly people into space aboard Dragon by the middle of the decade," SpaceX CEO and chief designer Elon Musk said in a statement. SpaceX is one of four companies — along with Blue Origin, Boeing and Sierra Nevada Corp. — to receive funding over the last two years from NASA's Commercial Crew Program. CCP seeks to spur the development of private American spacecraft capable of carrying astronauts to the space station. NASA hopes at least two of these firms can have vehicles up and running by 2017. After the retirement of the space shuttle program last year, the agency became dependent on Russian Soyuz vehicles to ferry its spaceflyers to and from low-Earth orbit. Blue Origin is developing a biconic craft called the Space Vehicle. Boeing is working on a capsule called the CST-100, while Sierra Nevada is building a small space plane named Dream Chaser. All four companies continue to hit the milestones stipulated in the latest round of funding, which was awarded last year and is known as CCDev2 (Commercial Crew Development 2), NASA officials said. In May, the unmanned version of Dragon became the first private vehicle to dock with the space station during a historic demonstration mission. 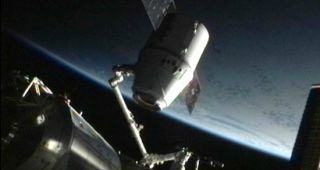 The flight aimed to determine if Dragon is ready to begin a series of 12 robotic supply runs to the station for NASA. Everything went well, and NASA officials have said that Dragon's first bona fide cargo mission could take place this autumn.